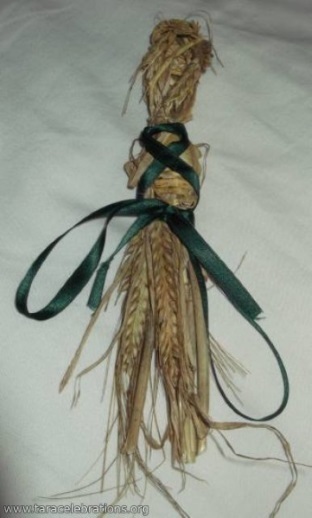 Beannachtai Lá le Gobnait... Blessings to you on the Feast of St. Gobnait. Gobnait, was also known as Gobnat or Mo Gobnat or Abigail or Deborah. 11th February the only day of the year that the ancient statue of St Gobnait is made available to pilgrims at Ballyvourney, Co. Cork. 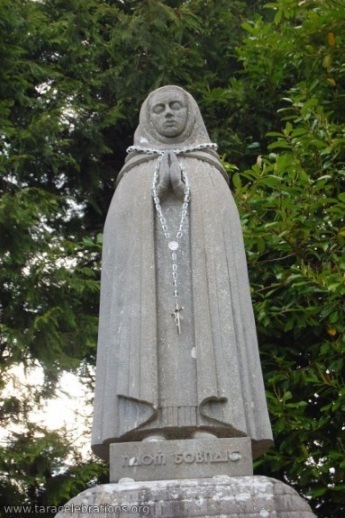 The statue is a treasured possession of the parish of Ballyvourney and has survived here in this parish since the 13th or 14th century. Made of oak, it is approximately 27 inches/ 68 cm tall. The back is hollowed out from the shoulder to the feet. The folds of the saint’s dress and a belt are still visible. The feature of her face are worn but the details of her hands are clearly visible. She is laid on a table and people queue to visit her. First you buy your ribbons, each cut to the length of the statue (Tomas Gobnatan, or Gobnait’s Measure). You wait your turn then once at the statue wind the ribbons around her neck, around her body, lengthwise on her body and some people scrunched the ribbons up and placed them over her heart. Finally you kiss or embrace the Statue. You take the ribbons home to protect you from illness over the coming year. Farmers often place the ribbons in outhouses to protect the livestock. O Gobnait, bring us safely through the coming year, and save us from every harm and infirmity especially smallpox. Bees are held in high esteem in Irish folklore, with the belief that the soul left the body as a bee or a butterfly. 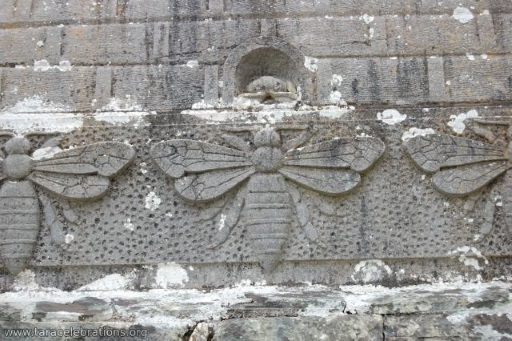 Gobnait is said to have added beekeeping to her life's work, developing a lifelong affinity with them and is known as patron saint of bees and beekeepers. Legend says soldiers came to Ballyvourney and stole livestock. As they left the village the saint let loose her honey-bees upon them. They promptly returned the cattle. She is also known as the patron saint of iron workers. One pet form of her name Gobba come from Gabha which means smith. Excavations St Gobnait’s House/Kitchen at her shrine in Ballyvourney in the 1950’s, prior to the erection of the modern statue of St Gobnait, revealed evidence of iron working (smithing and smelting). Unlike many other Irish saints, Gobnait’s life story was not written down during the medieval period. Today the main centres of devotion to Gobnait are on Inis Oírr/Inisheer (one of the Aran Islands), Dún Chaoin in West Kerry, Kilshanning, Co. Cork and Baile Bhúirne/Ballyvourney near the Cork/Kerry border. Evidence of the saint’s cult is also found in the dedications of churches and holy wells in the counties of Cork, Kerry, Limerick and Waterford. Gobnait is said to have been born in Co Clare. In her youth she went to the Aran Islands to study monastic life with St Enda and founded a church which still stands on the north side of the island near the shore. One day an angel appeared to her and told her to head inland and to find the place of her resurrection. She was told she would know this spot as it would be marked by the presence of 9 white deer. She travelled south in search of this place and her many stops are marked by churches and holy wells dedicated to her, such as the medieval church at Kilgobnet, Co Waterford. At various stages of her journey Gobnait met with white deer of varying numbers but it was only when she reached Ballyvourney that she found the nine deer grazing on a rise overlooking the River Sullane and looking towards the Derrynasaggart hills a place now known as St. Gobnait's Wood. This is where she founded a monastery with the help of St Abban and dedicated her days to helping the sick. It has been speculated that she used honey as a healing aid. She is credited with saving the people at Ballyvourney from the plague. Gobnait is remembered for her care of the sick. In the church yard at Ballyvourney many discarded crutches show that people believed they were cured by Gobnait answering their prayers. 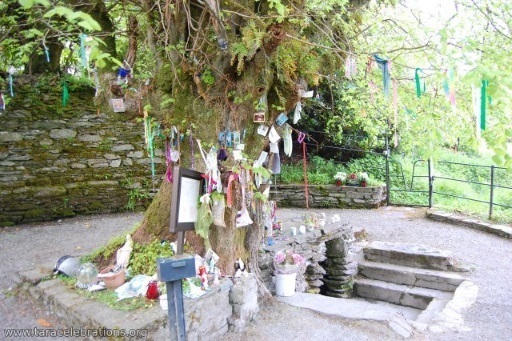 Her well is still at Ballyvourney and is an attraction for pilgrims.